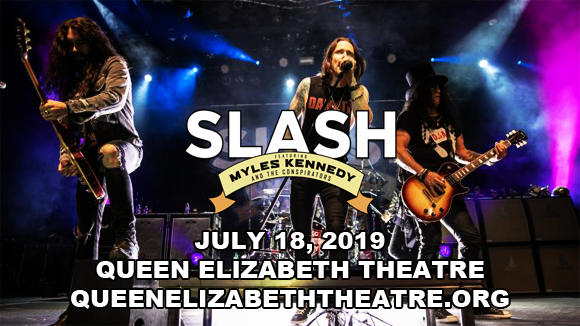 World-famous guitar god Slash comes to Queen Elizabeth Theatre on Thursday 18th July 2019 with his mighty band Myles Kennedy & The Conspirators on the Living the Dream Tour! Slash truly is living the dream right now, with a Guns 'N' Roses tour just around the bend and a new GNR album strongly rumored to be on its way, but for now the legendary shredder takes center stage with an epic solo tour that will rock your world! One of the world's greatest rock guitarists, English-American musician and songwriter Slash is best-known as the lead guitarist of hard rock band Guns 'N' Roses. Slash first came to public attention in the late-1980s with the release of Guns 'N' Roses' debut album Appetite For Destruction (1988) – the best-selling debut album of all time in the U.S. Slash enjoyed fame and success with the band throughout the 1980s and '90s, and after leaving Guns 'N' Roses in 1996 he went on to co-found the supergroup Velvet Revolver alongside Guns 'N' Roses bassist Duff McKagan, former GNR drummer Matt Sorum, former Wasted Youth guitarist Dave Kushner and Stone Temple Pilots singer Scott Weiland. Velvet Revolver's debut album, Contraband (2000), debuted at number one on the Billboard 200, and the band were a mainstream success throughout the 2000s. Since 2010, Slash has been a chart-topping solo artist, and has collaborated with a diverse array of notable musicians, including Ozzy Osbourne, Fergie of The Black Eyed Peas, Adam Levine of Maroon 5, M. Shadows of Avenged Sevenfold, Lemmy Kilmister of Motörhead, Dave Grohl, Chris Cornell and Iggy Pop. He has released two more albums alongside his band, Myles Kennedy and the Conspirators: Apocalyptic Love (2012) and World on Fire (2014), and in 2016, he rejoined Guns 'N' Roses.